Line a 13×9 pan with parchment paper, so that parchment extends over long side of pan. In a bowl, mix crust ingredients together with a fork; press mixture onto bottom of prepared pan. Bake crust for 20 minutes; while crust bakes, prepare filling. Cream together cream cheese, yogurt or sour cream, sugar and vanilla. After crust bakes, remove from oven and immediately sprinkle on 1 cup of semi-sweet chocolate chips. Pour filling over chocolate chips and return to oven; bake for 50 minutes. Allow cheesecake to cool for about hour, then place in refrigerator to chill overnight. Toast pecans in oven for 10 minutes at 350 degrees. Unwrap caramels and place in a microwave safe bowl, along with 4 tablespoons milk. Microwave in 30 second intervals until caramels have melted and sauce is smooth. Pour caramel sauce over cheesecake and immediately sprinkle on toasted and chopped pecans. Place chocolate chips in a microwave safe bowl, along with 2 tablespoons milk, and microwave in 30 second intervals, about 2 minutes total. 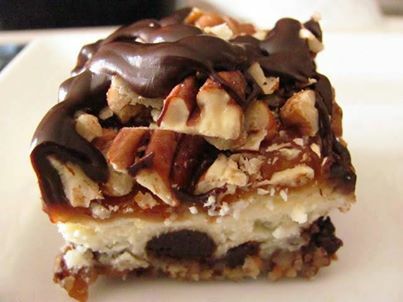 Stir until smooth and drizzle over caramel-pecan topping. Prepare brownie mix as directed on package for 13 × 9-inch rectangular pan, using water, oil and eggs and stirring coffee into batter. Bake and cool as directed. Place half of the brownie squares in the bottom of a 3-quart glass bowl. Prepare pudding mix as directed on package for pudding, Pour half of the pudding over brownies in bowl. 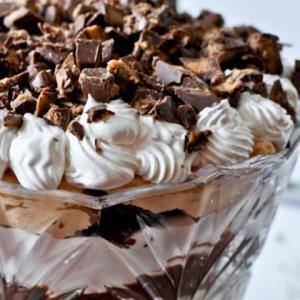 Top with half each of the toffee bits and whipped cream. Repeat with remaining brownies, pudding, toffee bits and whipped cream. Sprinkle with reserved toffee bits. Cover and refrigerate at least 4 hours before serving. Cover and refrigerate any remaining trifle. Anyone who’s outgrown classic s’mores will love this version: gooey-sweet melted marshmallow tempered by bittersweet chocolate cookies and salty roasted peanuts. Spread 1 tablespoon peanut butter (at room temperature, for easy spreading) onto a thin, crisp chocolate water (such as Nabisco Famous Chocolate Wafers). Slide 1 skewer-toasted marshmallow onto peanut butter. Top with a second wafer and squish down gently. Eat, licking fingers. 1.Preheat oven to 350 degrees F. Roll out pie dough onto a lightly floured counter top. Place 10 kisses around the edges of pie dough, about 2 1/2 inches apart (as in the photo above). Take a knife and cut a 2 1/2-3 inch circle around kiss. Fold half of pie dough around top of dough and pinch edge around top of kiss. Now, fold up both sides of remaining dough up to the tip of the kiss pinching edge. Now press together edges and form criss cross as shown in photo, step 3. 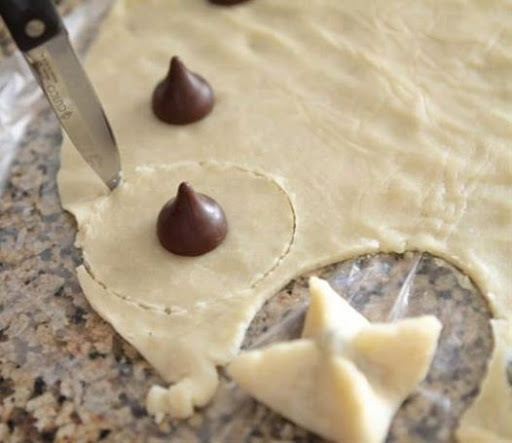 * *Continue cutting dough around kisses until all dough is used up. 2. Brush all little pies with an egg white wash then sprinkle with granulated sugar. Bake for 20-28 minutes or until little pies are golden. Remove and let cool for 5 minutes before transferring to cooling rack. Dust each with powdered sugar and serve. 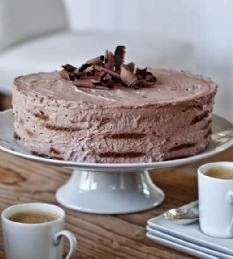 Melt butter with the cocoa or chocolate together in a heavy saucepan over medium low, whisking constantly till blended. Remove from heat and stir in the sugar. Whisk in the eggs and vanilla. Stir in flour, salt and walnuts. Mix well. Pour into a well buttered 8-inch square baking pan. Bake at 325 degrees for about 40 minutes till a toothpick inserted in the center comes out clean. Cool completely and cut into squares. These brownies are very fudgy and may be somewhat difficult to slice cleanly; use a sharp knife and a spatula to help them loosen from the baking dish.